GeoEngineers is part of the design and construction team for the first project outside of the US to receive certification from the Greenroads Foundation, a nonprofit organization that manages certification reviews for roadway and bridge projects using its Greenroads Rating System, a sustainability-rating system for roadway design and construction. The project, Canada’s South Fraser Perimeter Road, created a new four-lane stretch of highway spanning approximately 38 kilometers (24 miles) along the Fraser River in Vancouver, British Columbia. The road is part of Canada’s existing Highway 17 and routes commercial truck traffic away from local arterials. South Fraser Perimeter Road also provides an alternate route for emergency vehicles and connections to a network of municipal bike paths. GeoEngineers provided geotechnical design and quality assurance services for one of eight segments of the highway totaling approximately four kilometers (2.5 miles) of roadway, much of which is located along steep slopes of the Fraser River. 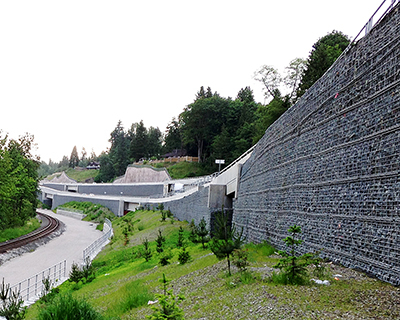 Services included contributing expertise on local glacial geology and geotechnical design related to slope stability, retaining wall design and bridge structures. The design in this segment included extensive use of tiered mechanically stabilized earth, soil nail walls and a viaduct bridge structure with driven pile and drilled pier foundations. South Fraser Perimeter Road was designed, constructed and financed under a public-private partnership agreement between Partnerships BC (a British Columbia Crown corporation) and Fraser Transportation Group (FTG). Detailed design development began in 2010 and construction was substantially complete with the highway open for traffic by December 2013, six months ahead of schedule. The Greenroads Foundation awarded the South Fraser Perimeter Road project bronze certification, noting a strong performance in credits earned for quality control practices, work zone safety management and environmental stewardship. This marks the sixth Greenroads-certified project on which GeoEngineers has worked. In 2011, the Greenroads Foundation acknowledged GeoEngineers’ work in sustainable transportation infrastructure by awarding them Greenroads’ first Vanguard Award. A segment of South Fraser Perimeter Road, where GeoEngineers worked.